This is the seventh in a series about how nine clients and friends successfully transitioned or transformed their careers after age 50. This month I will be describing how a good friend began his transition with a four month sabbatical, then made a successful career transformation just as he was turning 50. 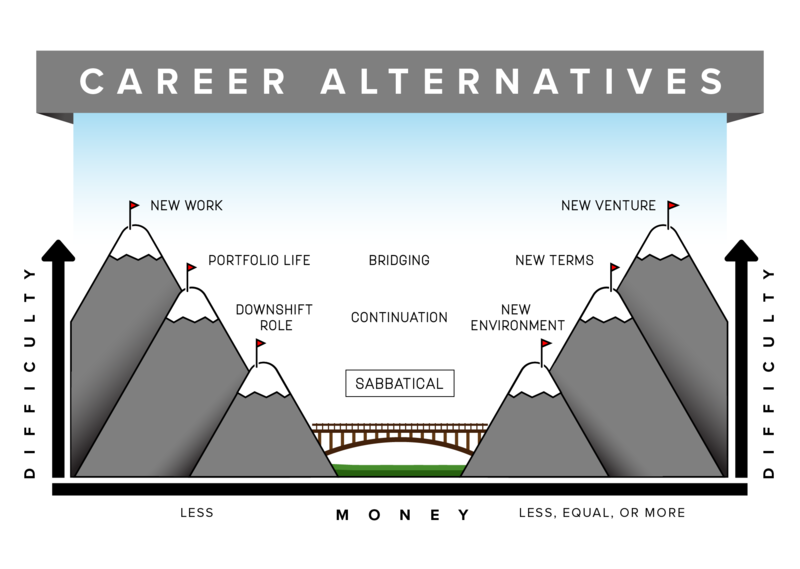 The graphic above reveals the degree of difficulty and the economic considerations for most career alternatives. 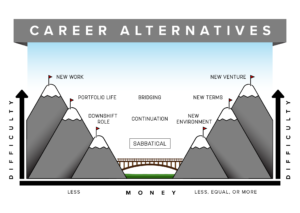 The sabbatical option has been placed in the lower middle of the model to symbolize that it is not meant to be a sustainable career option, but rather a “between jobs” break. This career alternative involves intentional time off for personal reasons, professional renewal and/or development. Bill’s background includes an MBA in Finance from the University of Minnesota, and four years of active duty in the US Navy. He spent 25 years in retail information systems (IS) with the US Navy, Deloitte & Touche, Target Stores, TG&Y Stores, National Convenience Stores and Tonka Corporation, with the last three jobs as Vice President. During his corporate career, Bill lived in seven different cities, six states and spent two years overseas. He owned and sold four houses, and has been married twice, to professional career women. In all he has raised three kids who have five grandchildren. Bill had become tired of job relocations and family separation. He wanted to settle his home life. His kids had graduated from high school and moved out to attend college. Bill wanted to start building equity and savings, and had an increasing interest in using his experience as a retail Information Systems/Chief Information Officer consultant. He had a succession of major roles in the management and consolidations of information systems staffs due to mergers. This had happened four times, and he had found the reorganizations and subsequent downsizings depressing. In the last consolidation, Bill received a golden parachute of one year’s compensation. He was free to go, and needed a break before returning to work. Bill was very adventurous during his sabbatical. He decided to backpack around the world with his wife. Luckily, she was on board from the start. They bought an airline pass that would enable them to visit 14 countries over four months, mostly staying in youth hostels. They met interesting people of all ages and backgrounds, and experienced incredible, exotic places. This experience eliminated all desire to return to corporate life. He developed a sense of empowerment, independence and entrepreneurial thinking. Bill researched, and started, a very successful independent consulting business upon his return. His sabbatical turned out to be the catalyst that helped him move from a succession of corporate leadership roles to what would become his next twelve years as an independent retail systems consultant. Looking back on the early stages of his consulting practice, Bill learned that startup risks (loss of income) were less than anticipated. Additional household income and support from his wife also helped lower Bill’s anxiety. He learned repeatedly the value of peer and sales rep networks that were instrumental contributors to his success in growing his practice. Bill finally had stable housing and a healthy income that enabled retirement savings accumulation. He learned to overcome his tendency to undervalue his services, and over time his fees increased and his time away from home decreased. Consulting travel, however, was extensive, occurring weekly for his twelve years until retirement. In the end, Bill preferred this travel to the many relocations in his past, and over time he was able to spend more time working from his home, less on the road. By age 62, Bill was able to officially retire with comfortable retirement savings. He shifted his focus to volunteering, family, and personal activities that allow him to fully enjoy his life today. From time to time, he ponders what emerged from his four month sabbatical, and has no regrets about leaving his previous corporate identity.